Mountain Camp takes pride in our excellent food. Our Food Service Director brings more than three decades of experience as a chef and certified nutritionist to our program. She has designed menus that meet camper’s tastes while still providing wholesome, healthy nourishment. A vegetarian, vegan, dairy free or gluten free option can be made available at every meal and a complete salad bar is available at every lunch and dinner. Plenty of choices are offered including fresh fruit and vegetables, a cereal bar and yogurt at every breakfast, and a peanut butter and jelly table is available at every meal. We have a snack table in our Main Lodge with locally grown fresh fruit and healthy snacks that are available for campers whenever they like. Food allergies are extremely common and our menus are designed with most common food allergies in mind. 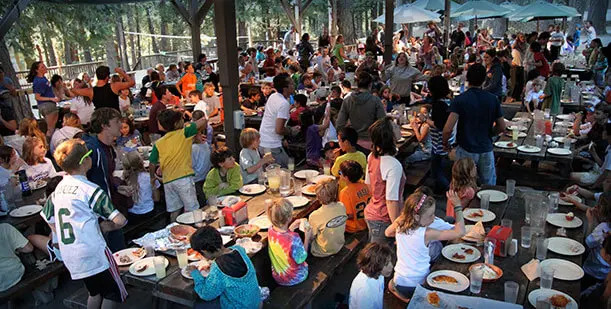 If your child has a food allergy or you have questions regarding any special dietary needs, please call our camp office at (415) 351-2267. Meals are selected to provide nutritious, delicious options that appeal to a nearly any taste. We serve our meals Family Style and our counselors serve campers individually at their tables. 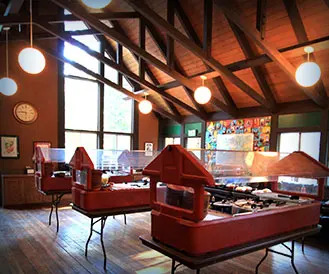 There is salad bar at every lunch and dinner and a breakfast bar at every breakfast that campers can choose from in addition to the main courses. Below is a sample menu. 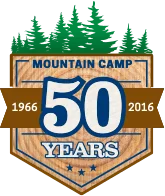 Please note that options are subject to change but this will give you a good sense for the meals at Mountain Camp.